The main objective of this mission, carried out with the assistance of Cristián Arévalo Pakarati, was to evaluate the status of the environmental monitoring equipment illegally removed in 2010 and to re-install it on site for a measurement campaign of seven months to November 2011. In addition, another objective was to complete the building of the fence on the site to ensure safety around both equipment and excavated areas and to avoid potential damage from cattle and horses. Finally, a few meetings in relation to the project were also organized with different people on the island. A close inspection of the condition of the environmental monitoring system showed that the different components (sensors, cables, data logger, solar panel, power) were not visibly damaged, apart from some marks left on the stainless steel mounting pole when it was illegally removed from its base. The cable connections to the data logger were still secured and the cables and sensors looked intact. The environmental monitoring system was then temporarily assembled outside the Mana Gallery and tested. Data were collected during the whole day and the results indicated that all the different sensors were working as expected. 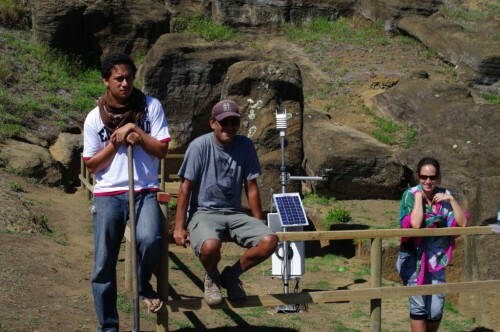 It was therefore decided to re-install in the next days the equipment on site in Rano Raraku. A visit was also paid to CONAF were we briefly met with Enrique Tucki and Irene Arevalo. After a general survey of the site, I collected information about the conservation state of the excavated parts of the statues while Cristián started with the building of the fence and later buried the toki found during the excavation of statue RR-001-156 in February. At the end of the day, some excavation supplies left on site in February were taken back to the Mana Gallery. Fig. 1: General aspect of the dorsal side of statues RR-001-157 (left) and RR-001-156 (right); photographs by C. Fischer. flaking or major losses of material through weathering. This obvious difference in the conservation state was not really a surprise and, from a conservation point of view, strongly supports the decision to backfill after the excavation has been completed and fully documented. However, close examination of the dorsal sides of both statues shows that the upper section of the part that was buried is in fact less well-preserved than the lower section. This is particularly visible on the neck and shoulders of statue RR-001-156 and the arms of statue RR-001-157 (Fig. 2) and could indicate that these parts were exposed at some point in the past. Correlations with previous excavation levels and soil stratigraphy now in process should shed more light on these differences. In terms of conservation, these upper parts will also be treated, but the question of extending the application of the product down to the bottom of statue RR-001-157 is still under discussion and a final decision will be taken in May. Fig. 2: Weathering features showing erosion and material losses in the upper section of the excavated parts. Left: left arm of RR-001-157; right: shoulder level of RR-001-156 (photographs by C. Fischer). Before heading to the site, some additional wood was purchased for the building of the fence. With the help of Dario, the main tasks carried out during this day consisted of building and installing the fence, putting in place the concrete block for the weather station and preparing the small surface trenches to bury the cables of the different sensors. Upon our return from Rano Raraku, we briefly met with Sonia Haoa Cardinali and Lilian Gonzalez Nualart and agreed on a visit to Rano Raraku on Saturday March 12. Rafael Paoa Rapu joined us for this working day which gave me the opportunity to discuss with him the outlines of the lithic analysis research project assigned to him by Jo Anne Van Tilburg in February. The goal of this project, which builds upon Rafael’s well-developed interest in lithic analysis, is to use the toki collection previously excavated and fully described by EISP as the core of an intensive scientific analysis and sourcing study. He will initiate that study in May by training in the use of the project’s portable XRF equipment. The work will extend to the location and study of at least two basalt quarries. We anticipate that this work will be in occasional cooperation with the survey team directed by Sonia Haoa Cardinali and Lililan Gonzalez Nualart and under the supervision of his current university study, and with the cooperation of CONAF. It is further anticipated that additional toki will be collected during the July excavation season. These toki will be registered by EISP in the same manner as the previous, but additional location information will be recorded as needed to facilitate the lithic analysis. The environmental monitoring system was re-installed on site inside the fenced area (Fig. 3). 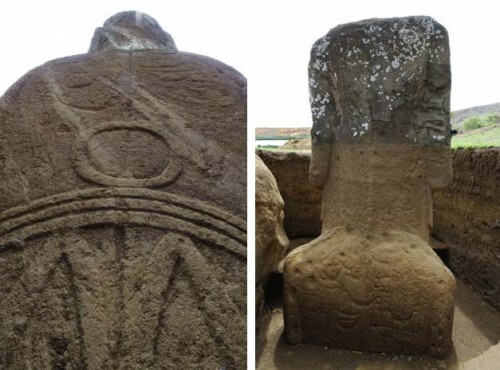 In order to accommodate the outline of the excavation around the statues, the position of some of the sensors was changed compared to last year’s layout. It concerned primarily the surface temperature sensor that was on the dorsal side of statue RR-001-156 and which is now temporarily located in front of statue RR-001-157, to the right of the other sensor, and records the surface temperature of the almost permanently shaded area under the chin (Fig. 3). When statue RR-001-157 will be backfilled, it is planned to move this sensor on the dorsal side of that statue. Protected with an adequate fence, the third surface temperature sensor was again installed in front of the inclined statue RR-001-158 located a few meters east of RR-001-157 to collect reference or comparative data on an untreated statue (Fig. 3). For the moisture and temperature sensors buried in the soil, one was again installed about two meters behind statue RR-001-157 and the others between its front and the main station (a detailed map with the location of each sensor will be provided later). Fig. 3: Environmental monitoring system with the new fence (left); the two surface temperature sensors in front of statue RR-001-157 (center) and the one for the reference data (right); photographs by C. Fischer. The purpose of the visit was to evaluate and discuss the various options currently under consideration by CONAF for the protection of the interior of Rano Raraku. Several suggestions concerning the improvement of the access pathway and other issues have been made to Lilian, but it could only be re-emphasized (as many other people did before) that the first priority remains a solution preventing the access of cattle and horses to the area with the statues, probably by the installation of a fence, and that potential available resources and any future actions should be directed toward this goal. The objective of the meeting with Tahira Edmunds was to give her a short training on the software used to download the data from the weather station. After a brief introduction of the environmental monitoring system and its components, the software was installed on her computer and we went through the procedure to be followed for the downloading of the data in preparation of the on-site training scheduled for the next day. A copy of the software was also left to her in case of computer failure. In the afternoon, I went to the museum, later joined by Cristián and Rafael who had returned from Rano Raraku, to check the quality of the remaining water-repellent product (Wacker BS290) that what used during the Tongariki conservation campaign and that has been stored at the museum for several years. After some difficulties, the 200 liters barrel could be finally opened and showed to contain still about 100 liters of product. The liquid looked fine though a bit hazy and a sample was taken for evaluation. After dilution with iso-propanol, a quick test on a piece of tuff indicated that the product had retained its water-repellent properties despite the long storage time. Based on these results, it was decided to use part of this product together with a new one that will be supplied by Monica Bahamondez P. from Chile for the application of the protective treatment. The last day, Cristián and I went to the site with Rafael Rapu and Tahira Edmunds (Fig. 4). While Cristián and Rafael were finishing a few tasks (burying of the extra cable length next to the concrete block, site cleaning, fence verification, photography), I gave Tahira some explanations concerning the function of the different sensors and the location of the moisture and temperature sensors buried in the soil and completed her training. Then, we carried out a real situation test and she could successfully download the data on her computer. For the next months, it was decided that she will go to the site every two weeks to collect the data from the weather station. Fig. 4: Last day on the site (from the left to the right: Rafael Rapu, Cristián Arévalo Pakarati and Tahira Edmunds; photograph by C. Fischer). In conclusion, with the re-installation of the environmental monitoring system following its illegal removal by vandals in 2010 and the re-fencing of the excavated areas around the statues, it can be considered that the initial objectives of the mission have been achieved. Moreover, important observations could be made and valuable information collected for the preparation of the conservation treatment phase of the two statues scheduled in May 2011. And last but not least, all of the individuals and agencies who have contributed to the success of this mission are herewith gratefully acknowledged.